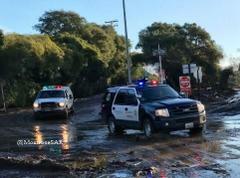 In a continuing effort to efficiently work with partnering governmental agencies, on Tuesday, January 16, 2018, through January 22, 2018, the Los Angeles County Sheriff’s Department (LASD) will be providing resources to assist current mudslide recovery and clean-up efforts in Santa Barbara County as part of a mutual aid request from the California Governor’s Office of Emergency Services (Cal OES). According to a Cal OES News report released on Monday, January 15, 2018, heavy rains, combined with burn-scarred areas due to the Thomas Fire caused massive mudslides in the Montecito area of Santa Barbara County. Thousands of residents were evacuated, homes were destroyed or damaged, and roads were obstructed. Cal OES has activated the State Operations Center to provide assistance to the Montecito community. The LASD acts as the Regional Mutual Aid Area Coordinator and will coordinate the deployment of law enforcement personnel from various Southern California agencies tasked with traffic and looter control in the Montecito area. We are proud to serve with these agencies as we assist the residents of Santa Barbara County to move forward and restore their community. We also are saddened and extend our condolences to the families who lost loved ones and experienced property loss in these horrific mudslides. The LASD as well as partnering agencies always stand ready to render services during times of need. Although the recent storm is past, we remind the residents in our own fire-scarred areas due to the Creek Fire and Fish Fire that inclement weather is still expected and encourage those in these precarious areas to continue monitoring weather reports, and check for status updates with local law enforcement, fire department and utility websites. *Prepare a “Go Bag” that includes a flashlight, batteries, bottled water, non-perishable food, blankets, warm clothing, first aid kit, cash, important documents, and other items you might need for at least three days. *Monitor local news and weather stations for updates. *Pay attention to alerts and warnings from authorities. *Stay home if you really don’t need to be outside. *Use extreme caution if you are using local roads and slow down for debris in the street. *Treat all non-working traffic signal lights at intersections as stop signs. *Stay away from downed power lines and report them to your local authorities.